The last body was found at the end of July, twenty-one weeks after the avalanche. 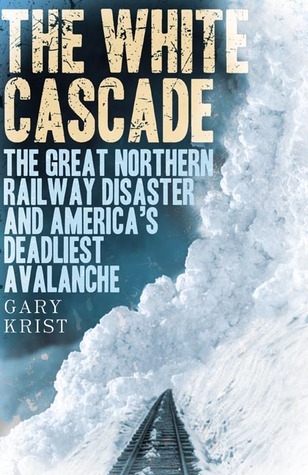 Premise/plot: Gary Krist's The White Cascade is a compelling nonfiction read about a tragic disaster. On March 1, 1910 an avalanche swept two trains off the track and into the canyon below. But that's not quite the whole story--the trains had been trapped on the side of the snowy mountain for six days. Snow slides kept trapping all traffic on the tracks. It was a demanding, never-ending, no-relief-in-sight job to keep the tracks clear of snow. And this week/weekend proved impossible. The storm was relentless. The White Cascade tells the story--the weather, the storms, the history of the railway, the management by James Henry O'Neill, the passengers and workers. It was an intense situation for all parties involved. Intense for O'Neill who was responsible--not for the weather, mind you, that would be nonsense--but for how the railroad chose to deal with the weather. He was in charge of which trains went where. He was in charge of determining which tracks stayed open, which tracks closed down; he was in charge of rerouting trains. He was in charge of managing resources--men, coal, other supplies, etc. It was also intense for the passengers on board the two trains. One train was a fast mail train who up until this time had had a great record for being dependable and on time. The other train was an express passenger train. Nobody stepped on that train expecting anything other than a quick train ride. Unfortunately it was worst case scenario almost from the start. My thoughts: I don't know if a book could get any bleaker than The White Cascade. The passengers soon became aware--after the first day or two--of the risks and dangers of being STUCK on the side of a mountain in a precarious place. True, there were attempts to calm them down by saying that this particular location had never been the site of a slide or avalanche before...but...common sense told most if not all of the adults that that meant NOTHING. There was much talk of doing something--demanding to see O'Neill, demanding the railway move the train somewhere else, demanding the railway try to rescue passengers and get them down off the mountain another way, demanding more be done to clear the tracks so the train could be on its way. There was this waiting, waiting, waiting, waiting, waiting. Would the storm pass? Would the weather improve? Were higher temperatures a good thing or a bad thing? Was it safer to stay on the train and wait out the storm? Was it safer to hike down the mountain on foot? (Some passengers did choose to hike down the mountain. It was difficult going--not without some risk--but it was possible.) Still not everyone could hike down the mountain--what about the mothers with young children? What about the elderly? the sick? This was a compelling read. I read it in two days--it was intense and heartbreaking. I don't know if it's possible to "love" a book this bleak, but, I love how well-researched this one was. I listened to the audio-book "The Christmas Train" by David Baldacci last month. A totally different outcome (it's romantic fiction with some humor) but interesting that it is the same premise as The White Cascade - a passenger train trapped by snow.